The video and sound installation Maintenant / Toujours is an invitation to a suggestive journey, a trip along a tree lined street. But the whole scenery is just to be seen as adumbration. The Austrian artist Jutta Strohmaier limited herself to catching only the play of lights and shadows on her path. The changing light situations invent a rhythmical space that is formed as a netting of shadow structures. With this work Strohmaier goes on a search for the quality of a moment. Through transformation and overlapping of spatial and chronological parameters, the artist tries to invent an aesthetic of movement and change, seeking a space of memory. A part of the projects presented by Jutta Strohmaier, at Le Cube, has been developed during her residency at Le Cube -independent art room. In her work, Jutta Strohmaier is interested in exploring the notion of space and focuses through her photographs and installations on the relationship between the image and reality. 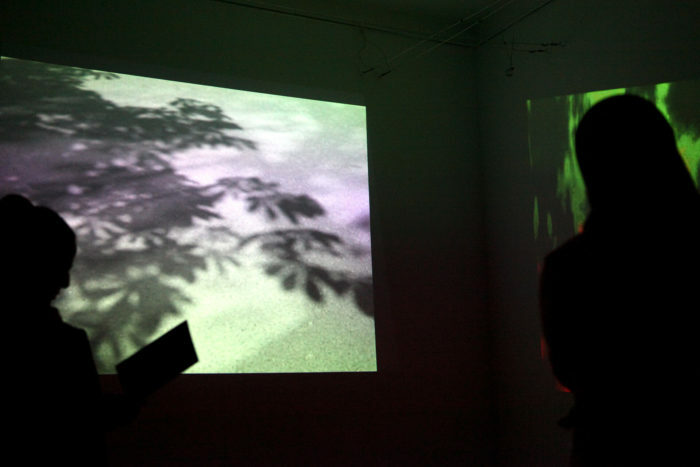 She also explores the way she can seize independent realities in her projects.